This was my favorite book when I was in 3rd or 4th grade. I loved the illustrations in this book. I loved the stories and rhymes in this book. I remember my book jacket was royal blue with gorgeous pictures. It was a wonderful gift from my parents. At that tender age, I didn't know that it was a Russian book translated into English. I, of course, had the English version. Along the way, as I grew up, other books became my favorite and this book got relegated to the bottom shelf; while I knew I couldn't part with it, I didn't pay much attention to it either. Then, when I went off to college and such, the book was completely forgotten. I am not sure what my parents did with my copy of the book. Knowing them, I am sure they donated it to some worthwhile institution. But, now that I have a wee tot who loves books, I was looking for something special to get her. 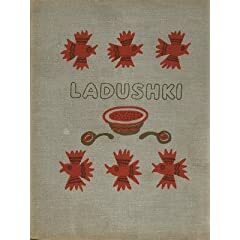 The memories of Ladushki came flooding back. I had to have this book. I searched some local bookstores; but didn't find one as this is apparently out-of-print. So, of course, I went where everybody seems to be going these days for out-of-print and obscure books: The Internet. And found it! (at what i think is a slightly steep price). I am absolutely thrilled at finding this used copy I now proudly share with my baby. I hope this becomes her favorite book too, at the right age, when she can appreciate it as much as I did/do.